Higgins beat a 21-year-old Trump for the last of his four world titles in 2011 and now a battling quarter-final victory at the 2018 Betfred World Snooker Championship has denied the Englishman probably his best shot at a world crown since. Seven years ago in the Crucible showpiece, Wishaw’s Higgins fought back from 10-7 down to triumph 18-15 and he demonstrated similar resilience to repeatedly come from behind in last night’s last-eight clash before clinching a decider to prevail 13-12. The 42-year-old Scot trailed 7-3, 10-8 and 11-9 before knuckling down and winning four of the final five frames to reach a ninth World Championship semi-final – where 26-year-old Masters runner-up Kyren Wilson awaits. Higgins’ victory included breaks of 43 and 41 to seal the decider and he showed all the fighting spirit that has epitomised a 26-year professional career. A fifth world title is now a distinct possibility for the seemingly ageless Scot, who is now the bookies’ favourite, with just two more victories in the one-table set-up at the Crucible required. Earlier Barry Hawkins and Wilson booked their places in the last four with ruthless demolitions of their quarter-final opponents. 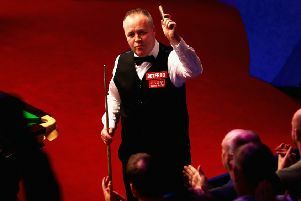 Hawkins thrashed third seed Ding Junhui 13-5 to set up a semi-final showdown with Mark Williams who beat Ali Carter 13-8. Wilson will face Higgins after beating Mark Allen 13-6. Both men took an 11-5 lead into the final session at the Crucible Theatre in Sheffield and Hawkins swiftly won the two frames he needed against a woefully out-of-sorts Ding, finishing the surprisingly one-sided contest in style with a break of 117. 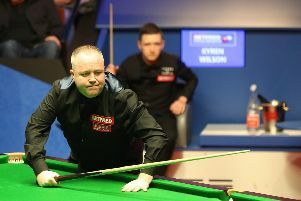 And although Allen kept his hopes alive with breaks of 54 and 40 in the opening frame, Wilson took the next two to gain a measure of revenge for losing to the Northern Irishman in the final of The Masters in January. Hawkins, who has reached the semi-finals or better in five of the last six years, told the BBC: “I’m in the semis but there’s still such a long way to go and there’s still some great players in. “I’m not getting too excited, I’ve been here before and I know what it’s like to go out there and play terrible, so it can happen at any time. I’m obviously over the moon to get through and I thought I played pretty well. I felt like he gave up at the end there. Wilson, who had lost in the quarter-finals in each of the last two years, told the BBC: “I definitely wouldn’t say it was the biggest win of my career, [but] it’s up there. It was always a goal of mine to reach the one-table set-up and I just can’t wait to get out there.